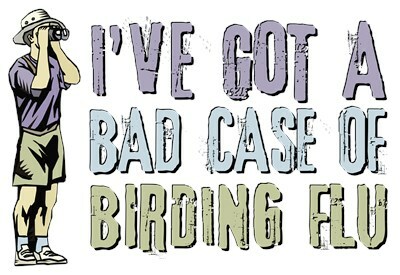 People might be afraid of getting Bird Flu, but around you, the chance of getting BIRDING FLU is much greater. Can't get enough of birding? To the point that you break out in a cold sweat if you haven't been out in the field? Legs twitching? Bloodshot eyes from staying up late poring over the latest family-specific field guide? These and more are classic signs of Birding Flu. Fortunately you and I both know the cure. To order by phone, call toll-free at 1-877-809-1659 from Monday - Saturday 9:00am - 9:00pm EST. You'll need to note the Product Number 030-998901060 to make your order.